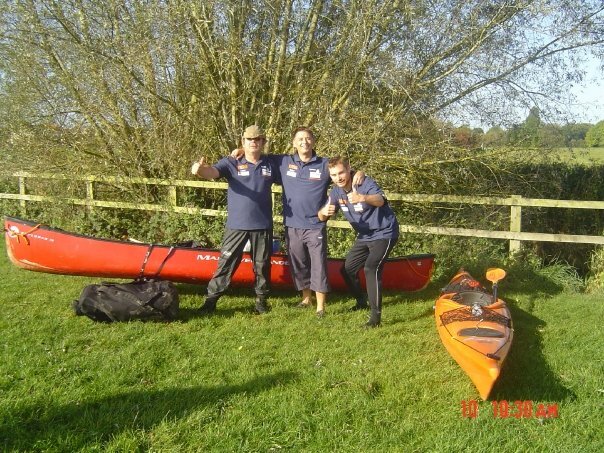 It was an unseasonably bright and warm Saturday morning when Rich Bates, new club member Nick Johnson, and Plymouth-based canoeist John Radoux met up in Cricklade to paddle the 135 miles and 44 locks of the non-tidal Thames to Teddington Lock on the outskirts of London, raising money along the way for Combat Stress. The trip was, quite literally, off to a bumpy start as low water levels necessitated much shuffling from Rich (in his kayak) and wading/dragging from Nick and John in their open canoe. Thankfully, water levels soon began to creep up, but with an almost endless succession of fallen trees and branches to negotiate, progress remained fairly slow and at times rather wet (Nick - we'll save your blushes and not mention the....!!). Once through the first lock, the obstructions became fewer and the paddling easier, and with the absence of any motorised craft to compete with, we could relax and enjoy the passing countryside. With 25 miles under our belts, we struck camp for the night at Shifford. On Sunday it rained.... A lot!! With about 30 miles ahead of us, we set off early with our sight firmly set on the warm welcome (mugs of tea and bacon sandwiches) that awaited us along the way 'Chez Isis'. Arriving just after lunch, soaked through but in high spirits, we arrived to a rapturous welcome from Ange and Freddie (Nick's wife and son), and Jen et al (Down at the club for the maintenance day). As if to herald our arrival, the rain even stopped to allow through a glimmer of sunshine. With the break in the weather as brief as our break from the paddling, we were waved off, into the drizzle, for the final 12 mile stint to our camping ground at Clifton Hampden, and a feast of beer, steak and chips at the pub next door. Tuesday got off to a cracking start. We hit the water early, with the morning mist still gently cloaking the river and the sun just beginning to break through. With the rowers out in force, the river felt both strangely bustling and serene at the same time. As we headed back out into the countryside, we again got the river to ourselves. With another long day ahead of us, the pace was steady, but relentless. 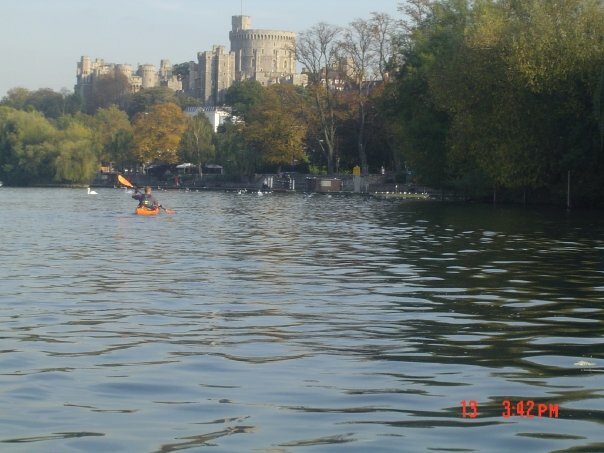 The appearance of Windsor Castle on the horizon was a welcome sight, reminding us just how far we had paddled already. Quite deservedly, we pulled up to treat ourselves to a brew and give our bodies a well-earned chance to stretch out. With another 10 miles ahead of us, the break was short-lived and we were soon back in our boats, and paddling out the other side of Windsor past Her Majesty's back garden. Passing under the M25 and the M3 reminded us how close we were to leaving the countryside for the concrete jungle ahead. Thankfully, we found an inviting patch of green, lovingly maintained by the Camping and Caravanning Club, on which to pitch our tents for the final night. Having all enjoyed a much needed shower, and with the finish line almost within sight, Nick treated us to a celebratory last supper (with beer!) - Thanks Nick. On Wednesday we awoke in high spirits, knowing we would be home and (almost) dry by about lunchtime. As we packed our boats, we got chatting to fellow camper Reg Jones, who proudly showed us his wooden-framed, stretch-canvas kayak in which, two years earlier (Aged 70!!! 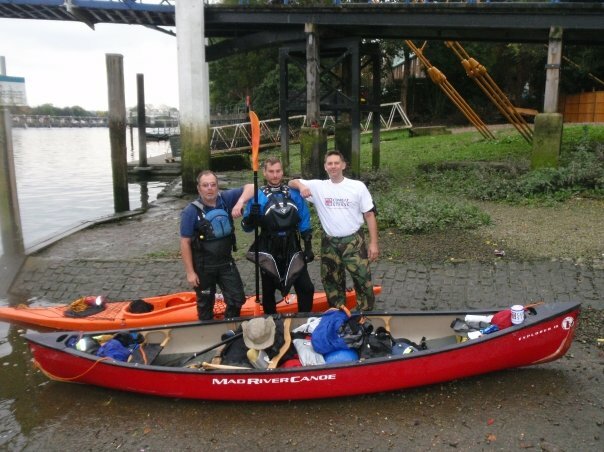 ), he had paddled the whole length of the river, all the way to the Thames Barrier! Buoyed by tales of Reg's past achievement, we hit the river for the final time. Compared to the distances covered over the previous days, the final 13 miles were a doddle. We even allowed ourselves a few moments to pause and admire the views of Hampton Court Palace (The real palace, and not the rather elaborate sewage works we I had mistaken for the palace a few miles upstream!!). Just after one o'clock the hallowed sight of Teddington Lock appeared on our horizon.